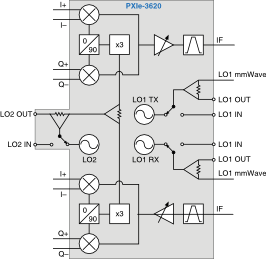 You can configure the PXIe-3620 RF Upconverter and Downconverter Module module to use an external local oscillator (LO) signal when preparing the signal for upconversion or downconversion. LO1—LO source for the mmWave radio head. LO2—Upconverts an in-phase/quadrature (I/Q) baseband signal to an intermediate frequency (IF) signal, and downconverts from an IF signal to an I/Q baseband signal, as shown in the following figure. When simultaneously using the transmit and receive channels, the IF frequencies for receiving and transmitting will be the same. The following table shows a variety of examples of resultant LO frequencies for desired RF frequencies.